The 18 meter fishing vessel Kingfisher ran aground on the River Thurso, Scotland with 9 tons of crab onboard. Three crew were taken off the vessel by the Aberdeen Coastguard. 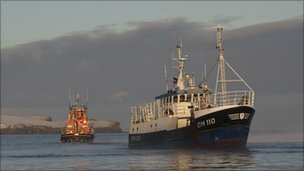 The vessel was refloated later the same day and towed to Scrabster Harbour.